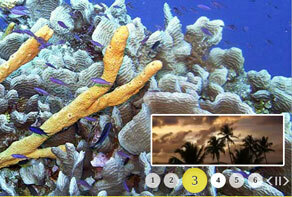 This tutorial will instruct you on how to create jQuery Slideshows using WOW Slider. 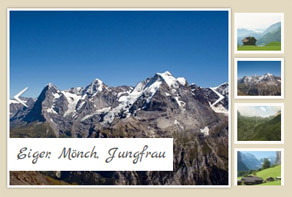 jQuery Slideshow: Live on the Page! 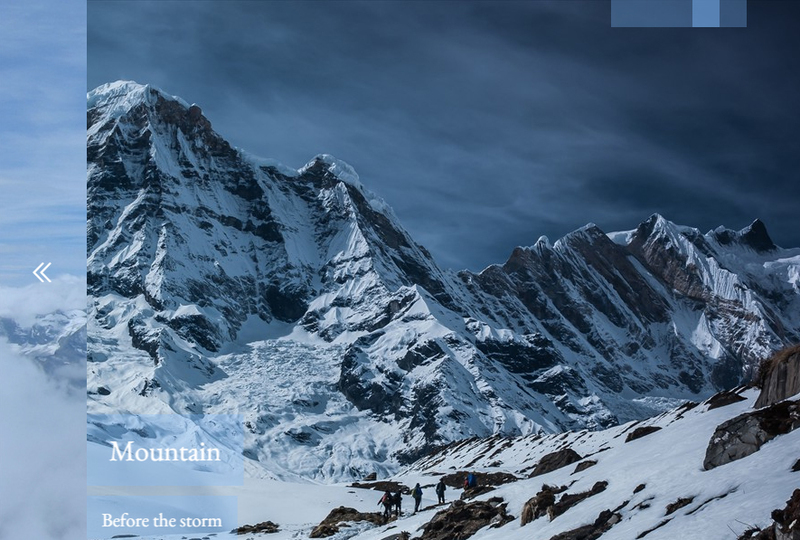 Here is one of the beautiful Slideshows made with WOW Slider and published on the page! The current demo uses a Balance theme. Arrow button is made of green round and a green arrow inside. The arrow becomes transparent on mouse hover which makes a nice effect. Thumbnails are simple: small white dots and green dots when selected. The description is written with the help of Source Sans Pro font. It looks modern and stylish on a white transparent background. The text elements of the presentation may be customized as it is being developed. For instance, the font color may be changed to match the background. During the example, the text appears as gray letters in a white box. While there were no links associated with the text in this demo, in your own presentations it is a simple matter to utilize this to help direct readers to different parts of your online store or site. 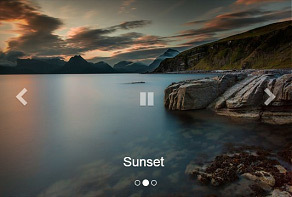 This demo is the example of the 'On-demand image loading' option. 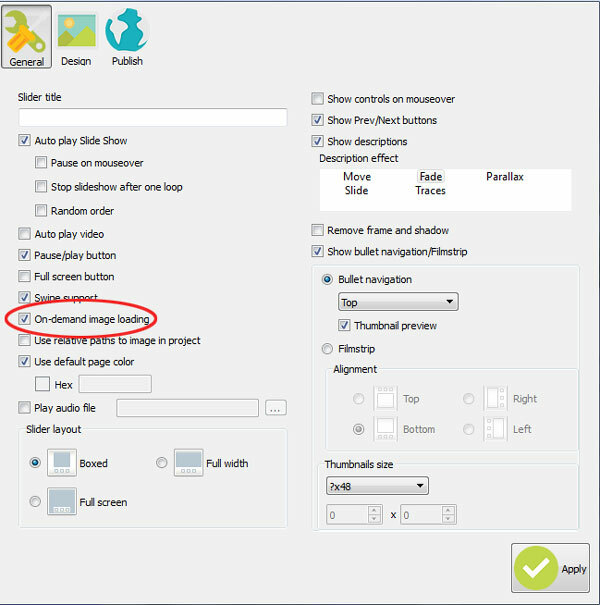 When you turn this option on, your images will be loaded from script, you won't waste your time waiting when all of your images will be loaded in the page. Each image loads only when you click on an appropriate bullet or when you click on a next/prev arrow. This function makes your slider work faster. If you want to enable this function, click 'Slider' - 'Properties', you can see an 'On-demand image loading' checkbox there. Select it. Now you can generate your slider with a huge amount of images. Built using the latest web technology, the presentation is filled with highly responsive elements that fade to the background when the cursor is not actively over it. For instance, the forward and backward elements (shown as green circles with their respective arrows) only appear when they are needed. The same goes for all elements, except for the background image. This enables people to see what you are offering, and quickly learn more without becoming overwhelmed with text. The transitions are smooth as well, swiftly swapping out the background image in a manner similar to an old projector. This gives the viewer the chance to quickly see what is coming next, while being able to remain on the same slide if he so chooses. Communicating the specifics of your product with consumers has become a challenge in this fast paced, mobile world. People simply do not have the time to waste reading page upon page of text. Interactive media has proven itself more effective in reaching potential customers, and in increasing the number of sales on a site. Interactive media, such as WOWSlider Presentations, may be utilized in both traditional and mobile settings, and can be utilized to display material for everything from content production sites to ecommerce establishments. I am a registered WowSlider user and want to know how to eliminate the narrow white side borders on the slideshow. Please send us a direct link to your website, so we can check it. Make sure that your style.css do not affect to WOWSlider. The thing is that you set "margin: 8px;" to your body section in style.css. And your WOWSlider is located in the body. I created a blank HTML page and inserted the slideshow into it without attaching any .css file. The same small white border on each side. Why are my wide images being cut off at both the top and bottom? When I run it in a live mode within Dreamweaver CC, it looks great. I have created the slideshow both as a full and wide screen with the same results. This is real important and any help will be appreciated. Did you mean what I've selected on the screenshot? Also, try to publish it to a folder and see if that happens again. Unless I missed, I haven't seen a response to my issue described below. I am very interested in hearing from you. Possibly, you use a full-width layout for your slider. It is the way it works: your images are centered. You can use a boxed layout instead, or also you can try to increase the height value. I want the output of the wow slider to fit within a div = 1000px. How do I do this? Thanks. 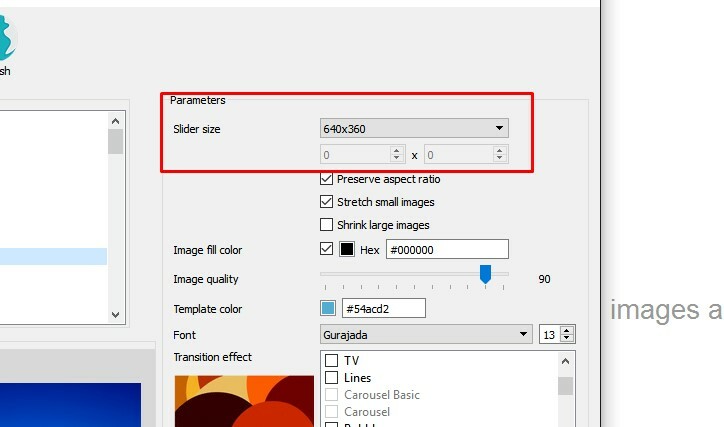 To set the size of the slider please go to Priperties-> Design->Parameters->Slider size-> chose "Custom size" and set size that you need. If I make some changes in a slider and I upload the newer version of Joomla I see : JLIB_INSTALLER_ABORT_MOD_INSTALL_ALLREADY_EXISTS. The only solution for me is to give the slider module another number. Is there another solution? It seems like you want to upload existed slider. Try in increase Slider ID in publishing menu and upload again. I bought a wow slider in 2014: 5.6 version. Is there an update possibility and what is the price? All upgrades are free within one year after the purchase. You can download the latest version of WOWSlider from the same link in your license message. You should delete the previous slider from everywhere in Joomla before adding a new one. Or you should give it another number. I have an older version of Wow slider 3.4 and the banners work fine on our website. When I view the site on my smartphone the banners don't look like they fit in the box and get bigger and smaller. If I upgrade to the latest version 8.7 will this issue be corrected? I don't have any other issues with my version 3.4. If I upgrade and the problem is still there I'll be looking for a refund. Let me know. Please try the free version of the WOWSlider 8.7 here: http://wowslider.com/wowslider-free-setup.zip Then if you would like you can update your license. You didn't answer my question. Will the banners work on mobile phones? Yes, sure. The WOWSlider slideshows work on mobile phones. Should the version 3.8 wow slider banners work on mobile phones? They're not working on an iPhone 6s. You version is outdated, so probably it doesn't work with the latest devices. Hi, we are testing out your slider and even though I inserted the URLS’s that we want the banners to link to, once we published its not there ---- they don’t link. What did we so wrong? Thanks! Everything looks good on our end. Are you still experiencing issues, and if so, can you explain a bit about them? What browser do you use? It's not working at all in Google Chrome, I click on the banners and they don't click through to the pages. Other browsers are ok. But unfortunately, most people using Chrom. Sorry, we cannot reproduce this issue. Could you please give us more details, maybe you can send us a screenshot or a screencast? Please try to do this: go to WOWSlider Properties -> Genereal-> uncheck "swipe support". Then replace the slider at your page to the new one. Question - we paid for this plugin last year but the watermark is still there --- how do I get it off? Hi, it's not letting me uncheck this box like it doesn't see I have the paid version. Please advise, thanks! That's what I tried to tell you in the FIRST email I sent. We purchased this years ago. it's not working, I republished the slider, the codes too, and the logo is still showing up? Make sure that there are no watermarks on your images. I just want a slide show I can play on my computer - I don't want to have to go to the web to play the show - Is that possible with Wow Slider I have Wow Slider Enterprise but I can't make a slide show that is not web based. 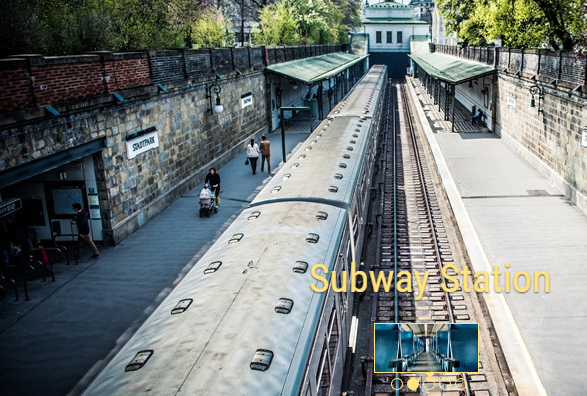 WOWSlider generates a HTML page with a slider. 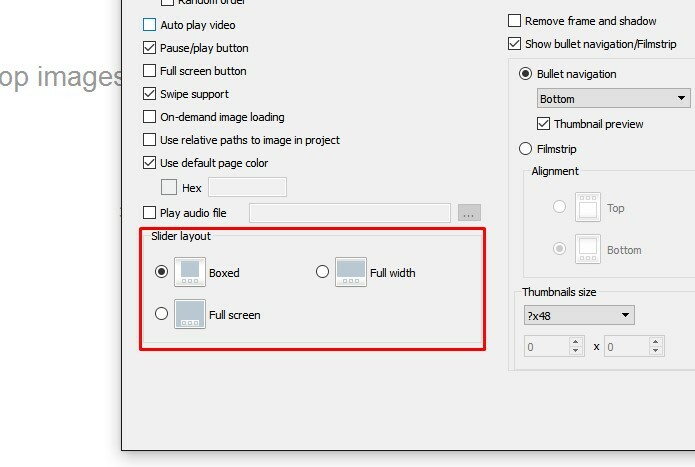 You can use "Publish to folder" wizard to save the slideshow on your computer. And then you can open it with a browser without doing to the web. I tried but it would not work for some reason - I will try again.